Cream puffs are a delicious treat for any time. They make great desserts for parties. 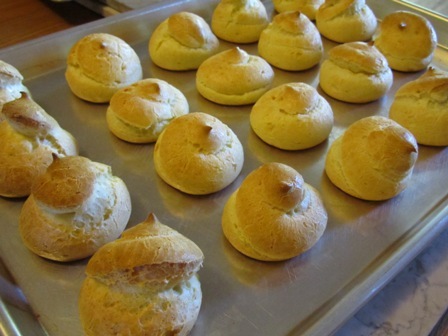 The best part is that you can make a bunch of them and then freeze them just like profiteroles! You willl be able to have a frozen treat any time you like. Be creative with the filling. You can fill them with custard, pastry cream or even just plain whipped cream and flavor the cream any way you want: chocolate, green or fruit flavored. 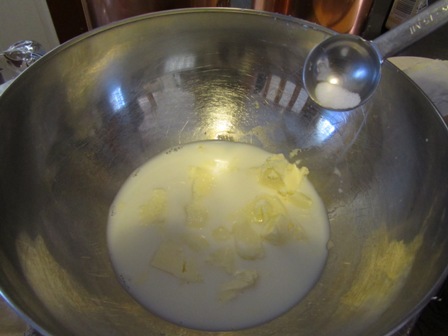 Mix together milk, butter, sugar and salt. 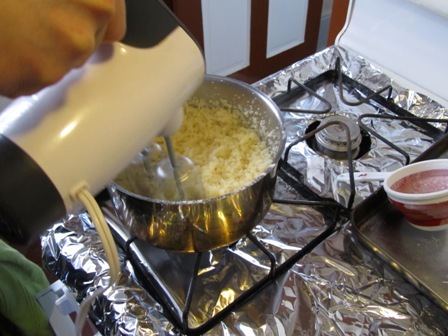 Make sure that you cut the butter in chunks as it helps the butter to melt. When the mixture is boiling add the flour. 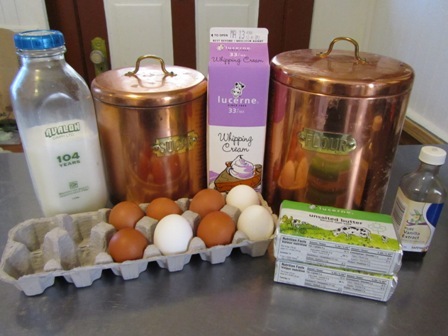 You can stir the mixture with a wooden spoon but we used a hand mixture. 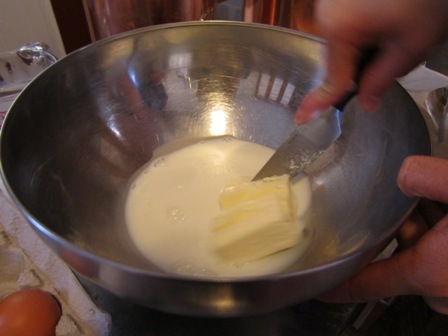 The mixture will look grainy. Test to see if the mixture is ready by using a wooden spoon. 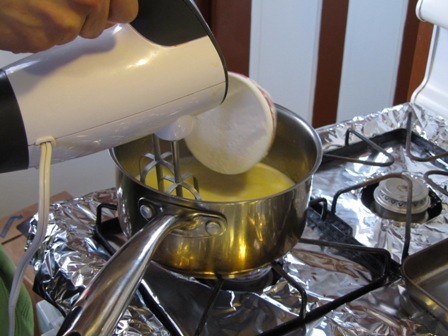 The mixture should not stick to the spoon or pan. Allow this mixture to cool for 5 minutes. In the stand mixture, beat one egg at a time. 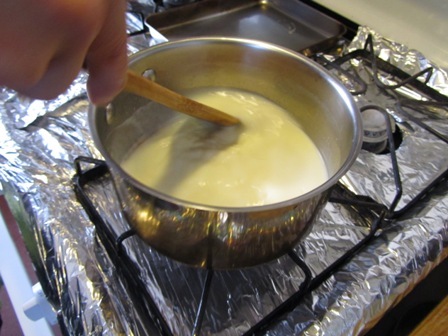 The mixture will look smooth and shiny. 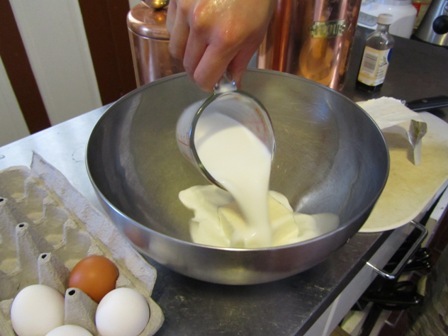 Place the mixture in a piping bag. Make the puffs 2 1/2 inches wide and 1 inch high. You can experiment with different sized puffs but I found that this size is perfect. 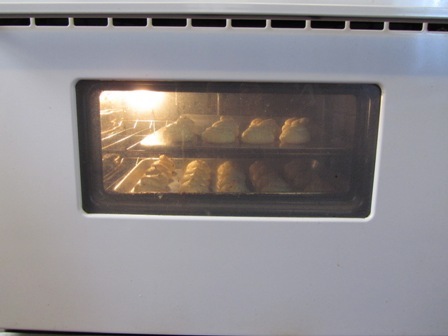 Place the baking sheets in a 400 degree oven for 10 minutes and then turn the temperature down to 350 degrees until the puffs become golden brown. Its fun watching them puff up. Allow the puffs to cool on a rack before filling with the filling of your choice. Enjoy! 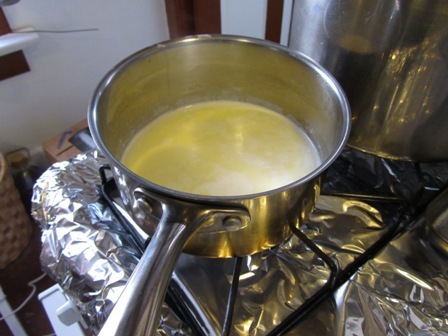 In a saucepan combine milk, butter , sugar and salt. Bring the mixture to a full boil. 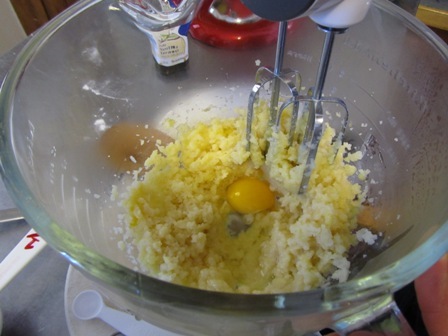 Add flour all at once and stir vigorously until smooth. 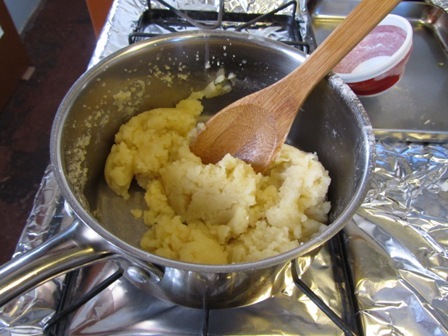 The paste will become dry and will not cling to the spoon or the sides of the pan. 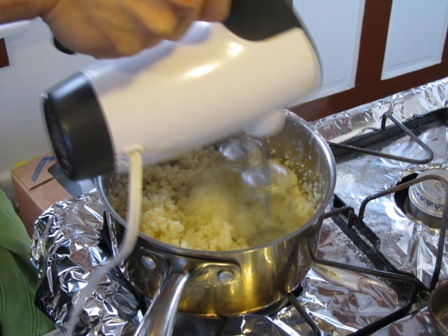 Do not overcook or stir at this point or the dough will fail to puff. Transfer to a bowl and let cool for 5 minutes. One at a time, add 4 large eggs. 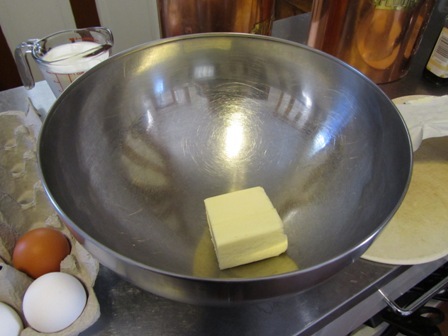 Continue to beat until the dough is smooth and shiny. 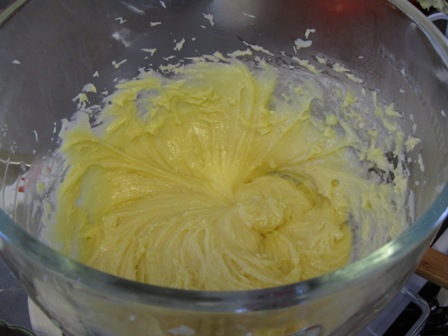 The dough should stand erect if scooped up on the end of a spoon. 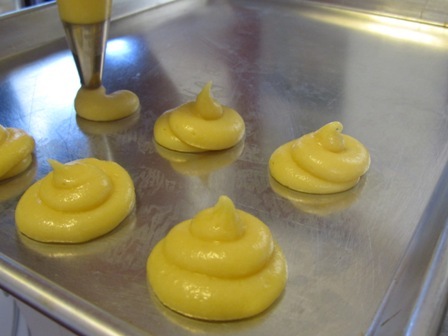 This paste is called a Choux paste and can be used for other desserts such as eclairs. Preheat the oven to 400 degrees Fahrenheit. Scoop the paste in pastry bag with a 1 1/2 inch plain tip. Shape the paste into 2 1/2 inch wide 1 inch high puffs on an ungreased baking sheet. Bake for about 10 minutes. Reduce heat to 35o degrees Fahrenheit and bake until golden brown, about 25 minutes. Remove to a rack and let cool. 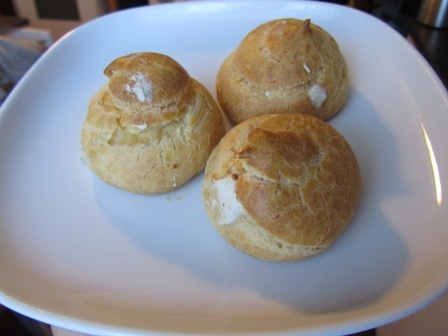 You can fill these cream puffs with custard or whipping cream. 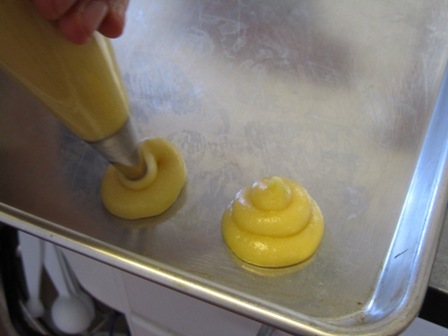 This can be done by either slicing the top or using a piping bag to fill the cream puffs. Freeze any left over puffs for tasty frozen treats. Next Post Mixed Berry Apple Jam!! Its jammed full of goodness.